I’ve talked briefly before about my application sample woes. A good portion of what ended up in my sample came from my junior year capstone project. I spent a year writing and revising poetry for it, and ended up with a nice looking chapbook, and some good to decent to bad poems. Everyone has a different strategy. Some applicants will submit things they’ve been working on for a while, others will submit newer stuff, and some will fall in the middle. The most important thing to remember about what you put in your sample is this: make sure it’s your best writing. The sample is the most important aspect of your application. Do not forget this. Do not focus less on your sample because you’re worried about your CV or recommendation letters or the GRE. Focus on your sample even more and on everything else too. Hey, no one ever said applying to creative writing programs was easy and not completely time-consuming. It’s also important to note that all of the advice I’m about to give is based on my own personal experiences. Take out the parts that work for you and throw away the rest. Talk with other applicants, people who are in MFA programs or who have graduated, your mentor, etc. Form your own opinions. And even then, remember no piece of advice has a 100 percent guarantee. What works for one person will not work for another. What a program wants one year might not be what they want the next. Start gathering your “possible” sample poems as soon as possible. When I say as soon as possible, I mean preferably in the summer, or in the spring for those of you who like a big head start. Don’t wait until the last-minute. It won’t be conducive to your revision process, your application process, or your emotional state. Once August hits, time runs down fast. Applications will be due in December and January, for the most part. You want as much time as possible to prepare. Create a yes, no, and maybe pile. Talk with your mentor if you can, with people from workshop classes—anyone who can give you an honest and helpful (this is a key word) opinion on your poems. Revision: is this thing on? Aw, yes, revision. I’m going to refer to the above section and repeat again—talk with your mentor or those whom you trust while you’re revising. Read your work with a critical eye, pretend it isn’t your own. What words need to be replaced with stronger words (when I say stronger, I mean, more accurate, exactly what you mean to say, or close enough to it)? Does it need more content, less? More space? A better title? At this point, you probably know what your weaknesses and strengths are, or at least have an idea of what they are.Focus on those too. If you know you struggle with titles, spend a little more time on them. Vice versa with anything else. There are a million questions you can ask yourself during the revision process, and what those questions are will depend on you who are as a writer and your poems. The most important thing is to have an outside reader or two to help you along the way. It can be tough revising one poem on your own, let alone upwards of 10 to 20. The length of your sample will vary depending on the program. The smallest sample I sent in was around 10 pages, and the largest sample was 20 pages. Most will fall on the lower to middle end of this spectrum. Unless a program asks you to send a specific number of pages, it’s usually up to you to decide if you’re going to send the maximum amount you’re allowed to. You don’t need to hit whatever the max is, especially if you’re thinking of including weaker poems in your sample. Now, if you’re dangerously close to the minimum, that’s a different story, and arguments can be made for either including weaker poems, or not including them. But the committee does need enough to get a sense of who you are as a writer, and where you could go. Order is tricky. Some applicants like to have an arc in their sample: be it narrative, thematic, whatever. I say put your strongest work at the beginning and then again at the end. Looking back, I’m not sure my sample necessarily had an arc. Some of the poems were in conversation with one another, but I would not have kept a stronger poem out of the front or back of my sample simply so it could be in “conversation” with another one. Something my undergrad mentor did with me was spread all of my poems out on her office floor. It’s much easier to move poems around and to see the “bigger picture” of your sample. Hanging your poems on a clothesline also works! I’m going to talk briefly about two more topics that came up while I was applying, and also when I was being accepted and wait listed at programs. Keep in mind—these opinions come from my own personal experiences, and may or may not be helpful to you. One thing I heard over and over was how important range was in a poetry sample. Because of this, I decided I wanted to include a sestina and a page and half long poem in my sample. I write very short, lyric poetry that focuses heavily on nature imagery. I got worked up about not showing enough “range.” I was afraid I would pigeonhole myself into one category and thus decrease my chances of getting accepted somewhere. 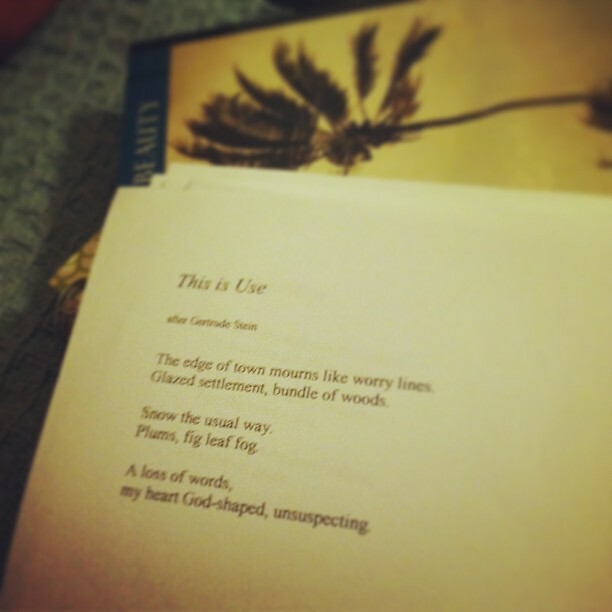 Right before I sent off my first applications, I cut both of these poems. I didn’t like them and I didn’t think they were as strong as the rest of the poems in my sample. I also had two other poems that I felt were stronger, but that did nothing to help my “range” dilemma. I remember my mentor telling me, “Well just cut them then. These are better.” And suddenly it felt silly to include poems that didn’t represent what I was interested in working on. I also learned there are a lot of ways to show range: thematically, stylistically, aesthetically. You’re probably showing range in one way or another even if you aren’t aware you are. Either way, please don’t cut out stronger poems for the sake of range. Or add in poems you think are weak or that you don’t want representing you as a writer. Personally, I would not spend too much time trying to figure out if a program is too experimental or traditional for your poetry. Two of the programs I got into have professors teaching there that write poetry fairly differently than mine (into experimental and language poetry territory, or far past it). There are a lot of reasons a program will or won’t want you. Spending too much time trying to figure out these “possible” reasons will only take time away from preparing your application. Even the more experimental or traditional programs usually have some students who are doing the opposite, or have students who come in and start writing differently from what was in their sample. Don’t sweat it too much. It might be helpful to a small degree, but it can also quickly snowball into distraction and an unnecessary obsession. Be critical but fair with your work, have fun, get the opinions of others, freak out, then remind yourself to breath, take breaks, don’t look at your sample right away after it’s been submitted to programs, be kind to yourself. Read, read, read. Write, write, write—no matter what. If you have any questions or counter points, leave a comment below! I’d love to hear from you. Reblogged this on Caitlin Neely. Is there a trustworthy page where poetry can be posted and workshopped for free? I follow a Facebook page for fiction, but haven’t seen one for poetry. Can I ask, when say a 10 page single-spaced sample is requested, do you separate poems by page or just put hem one after another starting halfway through pages? Is it alright to add a space between title and poem?